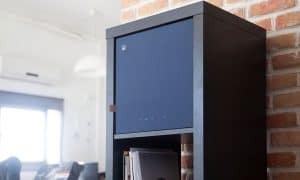 If you’re constantly misplacing important items, the XY3 Bluetooth item finder works well in assisting you in locating whatever you can attach it to. Nobody likes to lose their keys, wallets, bags, or phone and there are a number of Bluetooth item finders available on the market today. 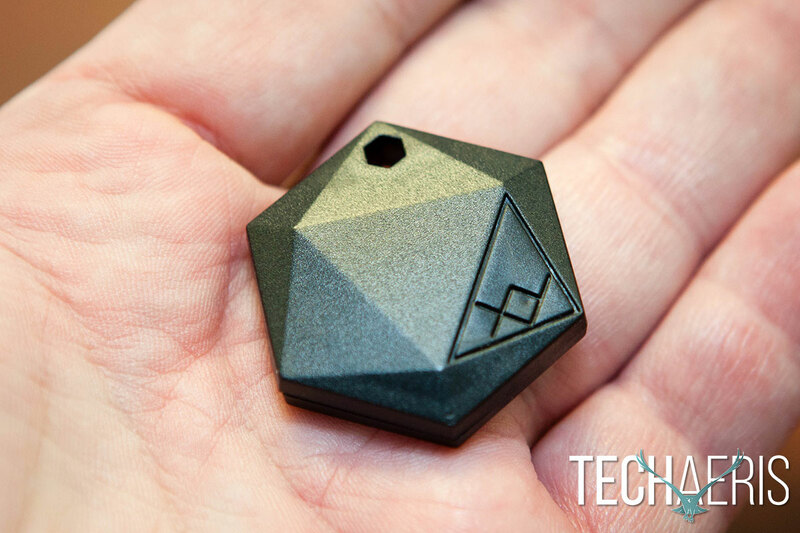 Our XY3 review takes a look at the third generation Bluetooth item finder from The Findables Company that lets you use your phone to find your misplaced items. 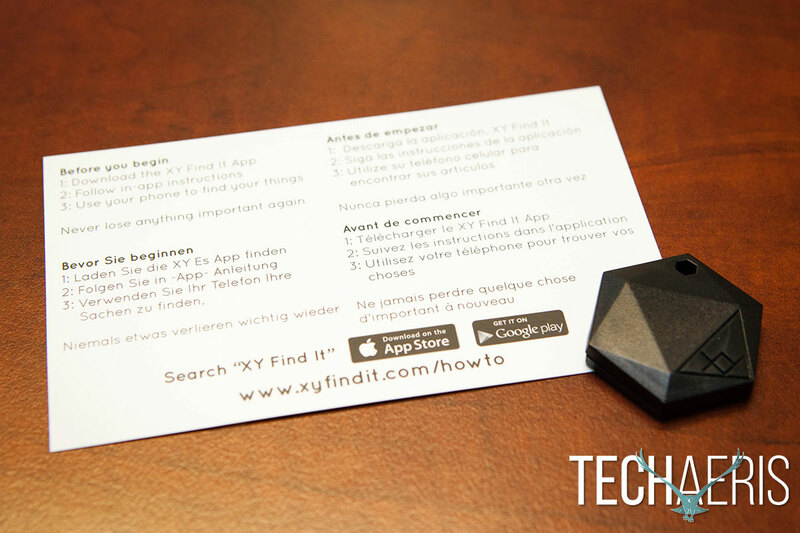 The XY3 Bluetooth item finder is a hexagon shaped plastic device about 1 1/2″ across and 1/4″ thick. 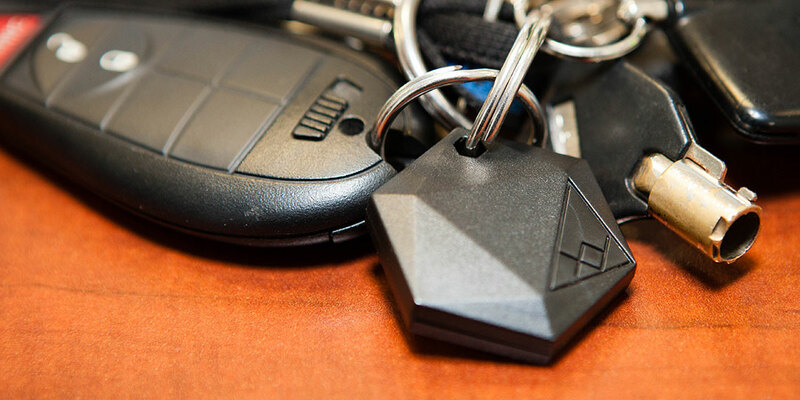 The bottom is flat, while the top has a raised triangular design with an XY button in the lower right area and a hexagon shaped hole near the top for attaching to a keychain. On the side near the top is a cut out area for making it easier to pry the XY3 in half to access and change the battery. Overall it’s a simple design and works well, although the hole at the top made for a bit of a tight fit when trying to fit it on some key rings. At about 1 1/2″ in diameter, it’s pretty small. The XY3 doesn’t come with its own key ring attachment, and that would have definitely been something I would have liked to see included. Our review sample was black, but the XY3 is also available in various colours including white, aqua, blue, orange, purple, and a number of other choices. The XY3 requires a companion XY Find It app, and it was easy to pair and register with my phone. The app walks you through the setup process and after complete you simply click on the icon for the appropriate XY3 device (if you have multiple in use) and it will beep until you turn it off by pressing the XY button on it. Alternatively, you can press the XY button on the XY3 unit and it will ring your phone until you click on the alert message on your phone to dismiss it. If you have the KeepNear function enabled, if you walk out of Bluetooth range of the item you have the XY3 attached to, you’ll get a notification saying that you’re out of range and then another once you’re back in range. The XY3 is compatible with Android and iOS devices. 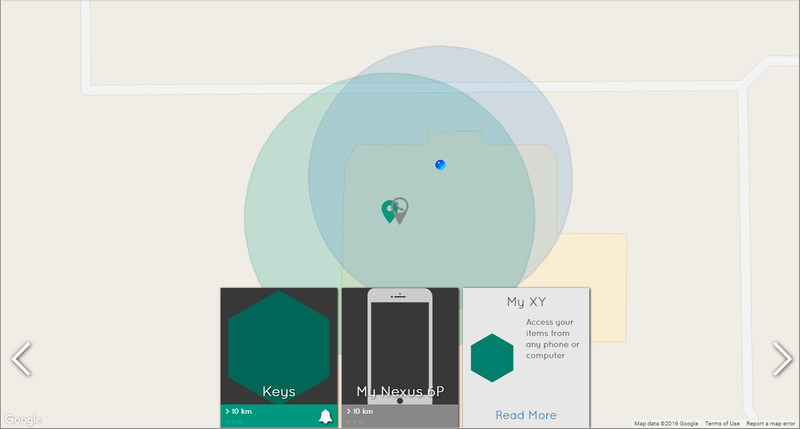 During our testing we used the XY Find It Android app on a Nexus 6P. The app is pretty simple to use. On first launch you’ll be required to create an account. 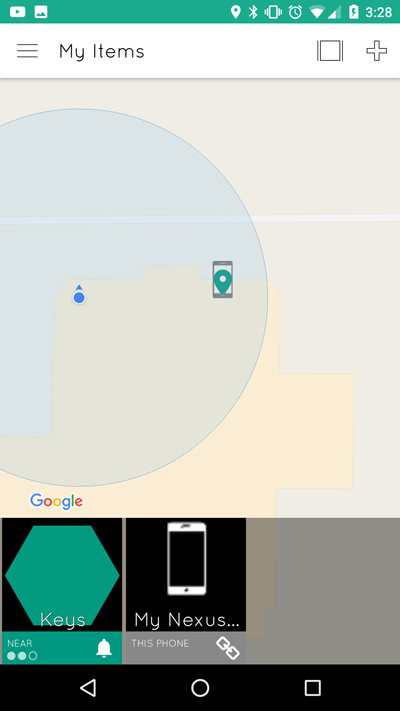 While creating an account might seem like an unnecessary step, it allows you to track your item (based on last known location) and phone on my.xyfindit.com as well. Once you’ve done so, it will walk you through the steps of connecting your XY3 to your phone and then you’re basically good to go. my.xyfindit.com screenshot showing XY3, phone, and your location. As far as the actual XY Find It app is concerned, once you’ve attached one XY3 to it, you can add more, view your items, access the XY Store, and adjust settings like vibrations, notifications, disabling the phone ring, and more. Overall it’s a simple app but it has a simple purpose and does it just fine. The XY Find It Android app. The XY3 is a simple device, and worked as expected. Pressing the button on the XY3 rang my phone without hesitation, and selecting the icon for the XY3 on my phone or the web interface allowed me to locate my keys as well with no issues. While I didn’t test it, you can also mark an item as lost and allow it to become trackable by other XY users, and they can then securely communicate with you via the app should they find your lost item. At $24.99USD, the XY3 Bluetooth item finder is priced pretty much the same as other similar products on the market. Depending on how often you’re apt to lose or forget a specific item, $25 could be a small price to pay for some peace of mind. You can also save by buying a 3-pack for $59.99USD which almost gets you one free when you buy two. 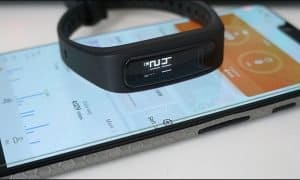 That value may increase over time as the company redesigned the internal hardware from previous versions with services like Zapier and IFTTT in mind, and in the future plan to utilize functionality on the XY button on the XY3 to allow users to turn on radios, open garage doors, or adjust the thermostat. If you’re constantly losing your keys or misplacing other important items, the XY3 Bluetooth item finder works well in assisting you in locating whatever you can attach it to as well as your phone. Easy to use, simple to set up, works as expected. A bit pricey, can buy in multiples to reduce the per tracker cost. If you're constantly losing your keys or misplacing other important items, the XY3 Bluetooth item finder works well in assisting you in locating whatever you can attach it to as well as your phone. 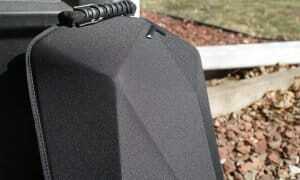 *We were sent a review sample of the XY3 Bluetooth Item Finder for the purposes of this review.